The Marais A Chair is a galvanized steel cafe chair that celebrates industrial materials, processes, and craft. Designed and tooled by French metalworker Xavier Pauchard in 1934, the Marais A Chair continues to prove itself to be durable and attractive for a range of uses in cafes, restaurants, and homes. 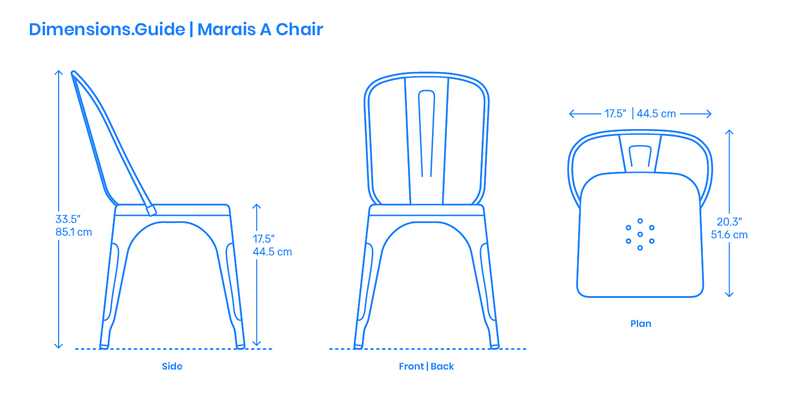 The Marais A Chair has a back height of 33.5” | 85.1 cm and a seat height of 17.5” | 44.5 cm. The seat width is 17.5” | 44.5 cm and has a depth of 20.3” | 51.6 cm. The chair is built with galvanized steel and is often powder-coated with various paint finishes.